Does Dashlane have a referral program? To modify your subscription or billing information, please consult the instructions below. Business users please refer to the following article: How to edit the settings of your Dashlane Business account. If you previously paid for your subscription on our website using a credit card, you can edit your billing information inside the web app. Once logged in, click on "My Account" in the lower left-hand corner, select "Account Summary", and finally click on "Update card". There you can edit or update your billing information. If you paid for Dashlane through the Google Play Store, open our web app, click on "My Account" in the lower left-hand corner, select "Account Summary", and finally "Extend subscription" to add more time to your plan. If you originally purchased an auto-renewing Dashlane plan using PayPal, or through the iOS App Store or Mac App Store, and you wish to subscribe through the web app, you will first need to cancel your subscription renewal through the service you used. See below for details. To cancel your subscription, the instructions depend on how you originally subscribed. If you aren’t sure how you originally purchased Dashlane, see the instructions below about how to consult your receipts. If you purchased your subscription via the web app or the desktop application using a credit card, open the Dashlane web app, click on "My Account" in the lower left-hand corner, select "Account Summary", "Manage subscription", and finally "Downgrade from Premium". This cancels your subscription's auto-renewal. Note that this will not deactivate your current subscription before its renewal date. If you purchased an auto-renewing subscription with PayPal, or through the iOS App Store or Mac App Store, you cannot manage your subscription directly through our web app, but must cancel your subscription directly through that service. Instructions for PayPal can be found here. Instructions for the iOS App Store and Mac App Store can be found here. If you purchased your subscription through the Google Play Store, your subscription will not automatically be renewed, and there is no need to cancel. "View receipts" button to see the list of all the receipts ever generated for your Dashlane account. If you like, you may download your receipts. Choose the one you wish to view or download, and click on "Download". Note that this feature is available only if you subscribed from our website, or from the Windows or Mac desktop application. 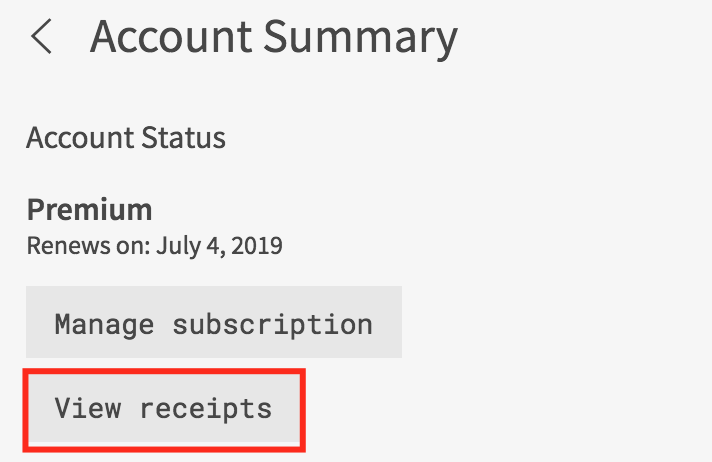 If you subscribed from our Google, iOS or Mac App Store apps, you will receive a different receipt from Google or Apple. 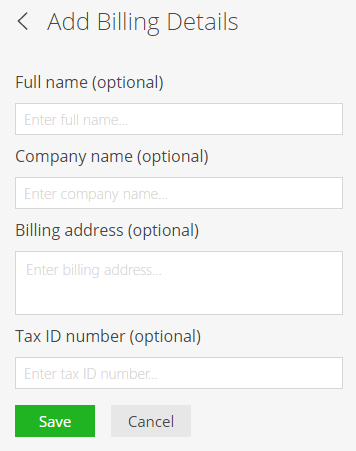 Before your download starts, you will be offered to customize your receipt, in order to add a full name, a company name, a billing address, and/or a tax ID number. Note that these are all optional. Once you are done, click on "Save" and your receipt will be downloaded shortly.